CNN’s Connect the World is broadcasting a three-part series on child-witch stigmatisation; as with other reports on the subject (most notably the documentaries for Channel 4 I blogged on here and here), there are depressing and poignant scenes of battered and bewildered homeless children who have been cast out by their families in Nigeria, thanks to pastors who teach that misfortune can be attributed to children who are supposedly witches. The first part contained input from Sam Ikpe-Itauma, who runs a hostel for stigmatised children, as well as Justin Bahunga of Africans Unite Against Child Abuse (which has dealt with ten cases of witchcraft-related child abuse in the UK so far this year; I blogged on the UK situation here), and Philip Alston, a UN Special rapporteur who has previously highlighted the problem. The segment with Sam can be seen here. …One of the most notorious and influential pastors is Helen Ukpabio of Liberty Gospel Church. Her 1999 film, the widely distributed, “End of the Wicked” has been attacked by child rights groups for its depictions of Satan possessing children. She had agreed to an interview but the meeting was continually postponed for two days. But in her preaching at Liberty Gospel Church, she heralds success stories of how she has driven out demons through deliverance. “Witches and wizards, they started getting afraid. I never gave them rest!” she shouted to a cheering congregation. I’ve written about Ukpabio on numerous occasions, with the result that I have received a number of abusive messages from her followers. She has also tried to have Sam’s hostel shut down, accusing him of being a “wizard”. Richard Bartholomew, Leo Igwe, and his father are all useless fools. you people have not seen any thing yet. Bad dogs barking in vain. Connect the World goes out in the UK at 9.00pm (Freeview channel 84), and part two of the investigation will be broadcast tomorrow. Click the logo below for information about a charity working in this area. 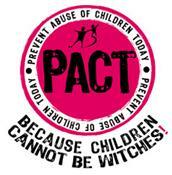 The issue of child witches in Nigeria happens to be part of the state failure at all levels of the society or else, how can a family allow its own children to be so treated to the point that six inch nail is put through the brain of a child? this is the current state of Nigeria in the year 2010 and the people of that country appears to be living with it without even moving a finger to challenge a total failed and collapsed state institutions that suppose to stand up to protect these innocent kids. When the country of Nigeria is restructured, those kids will get better treatment with dignity that they deserve from their true leaders and not common criminals who are nestled at Abuja and whose common occupation remains treasury looting along with sharing oil money and nothing else. There are also other issues that bleeds the heart in Nigeria such as extra judicial killings by the police and army and all these are known to those in leadership positions but since they are ‘make believe leaders’, they don’t care if the entire country goes up in flames. The case of this children reminds one daily of the rotten state of Nigeria and if there is any chance that she will recover, it is even made impossible by the so called religious outfits who are merely profiting from the fears and insecurity of the population. Richard Bartholomew, i thought this blog writes on religion, how come you have become CNN reporter? you are a confused idiot, no matter what you copy and paste, Liberty Gospel church will continue to cast out demons, and will never never stop. Go ahead and write your usual nonsense for i am not surprised at all because i know that this blog has been a platform for lies and fabricated stories .Christian Purefoy is an Atheist but he lied that he is a Christian, he is as confused as you are senseless fools.